All roads lead to WrestleMania, which will take place on April 7, 2019. Storylines are set to end at The Show of Shows, while new ones are set to begin. The Extreme Rules PPV, which will be held in July following WrestleMania, and Money in the Bank PPVs, will be hosted at the Wells Fargo Center in Philadelphia, Pennsylvania. We have some interesting updates on whom Roman Reigns and Seth Rollins could face at the sixth PPV of the year. Rollins is set to face Brock Lesnar at WrestleMania 35, hoping to win his first Universal title. There hasn't been much information on if and whom Reigns will face at The Show of Shows, but all rumours point toward Baron Corbin or Drew McIntyre being Reigns' possible opponent at WrestleMania 35. CBS Local are reporting that Reigns and Rollins will feature in the Extreme Rules card in Philadelphia. Also Read: WWE Rumors: WWE drops big hint on Brock Lesnar's WWE future? The PPV will be held on July 14, 2019, and will see Roman Reigns face off against Baron Corbin, while Seth Rollins will face Drew McIntyre at the Extreme Rules PPV. Corbin will be facing off against Kurt Angle at WrestleMania 35, which will be Angle's final match in the WWE. 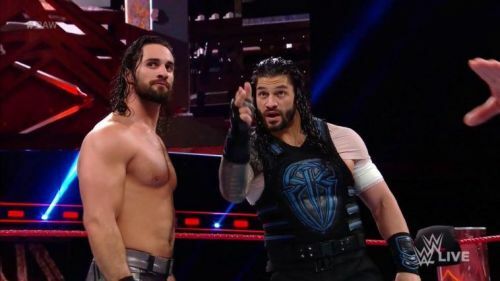 The next PPV in the WWE is WrestleMania 35, which will be held on April 7, 2019, followed by Money in the Bank on May 19, 2019, and then Extreme Rules, on July 14, 2019.
Who do you think Roman Reigns and Seth Rollins face at Extreme Rules? Comment below!